The completely welded cutting chamber in conjunction with the “V” type rotor design ensures dependability in operation and universal application use. The housing design offers easy and quick access to the cutting chamber during rotor and stator knife changes, servicing or screen changes. 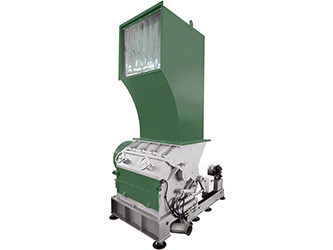 The E series are economical granulators designed for use as the central granulator for medium volume, in-house recycling. The cutting geometry of the E series allows for small thin-walled, bigger hollow pieces or voluminous materials to be ground. The complete E series line achieves a high quality regrind independent of the material type or form such as wood, coconuts, grasses, paper and cardboard, etc. The E granulators are available with different rotor options to fit different applications, all rotors feature the V-cut technology creating a high quality regrind. The base of the E 70 series makes the machine very sturdy, while maintaining the easy accessibility for maintenance and cleaning. The E series granulators’ user-friendly design allows quick and easy access to the cutting chamber for maintenance and cleaning.